Painting with Bob Ross-- with artwork created by Bob Ross himself using his specially formulated oil paints, brushes, basecoats, and other tools--introduces artists and Bob Ross fans to the basics of painting landscapes. Everyone will enjoy Painting with Bob Ross , as his "happy accidents" approach makes this challenging subject matter enjoyable for all ages, regardless of skill level and materials used. In 1982, The Joy of Painting made its debut on public television. The unrehearsed, unedited show soon became a favorite among aspiring artists and painters. Almost 40 years and 403 episodes after his on-air debut, and decades after his untimely passing, Bob Ross still has enormous global popularity as a beloved painter , affable TV personality , and cultural icon . With this guide, you can learn to paint a happy tree in seconds, just like Bob Ross! Painting with Bob Ross introduces you to the tools and materials you need to paint beautiful landscapes, as well as basic painting techniques , such as how to load your brush and how to paint with a knife. Following the introduction are 16 painting projects , each with a complete list of tools and materials needed and instructions for preparing the canvas. Jump into painting with step one, then follow the full-color painting progressions and clearly written instructions until you've reached the final step--and your new, joyful work of art! This is the only Bob Ross book with all-color images. Even if you're brand new to painting, remember that Bob said, "Talent is nothing more than a pursued interest. All you need to paint is a few tools, a little instruction, and a vision in your mind." Throughout this book, Bob's quotes encourage you to keep going . 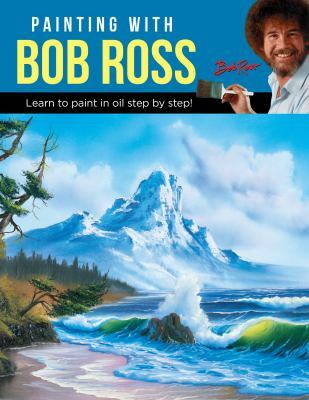 So grab your copy of Painting with Bob Ross , relax and unwind, and paint a Bob Ross-inspired landscape! You can paint graceful mountains , ocean waves crashing onto rocks , a winter cabin , a lakeside path , a deep forest river , and many more breathtaking views. And don't forget to sign each of your masterpieces once you've completed the last step!